How does a wheel go round? All the parts of the wheel need to be in place, otherwise it will not roll. No single part can successfully perform its mission without the help of the other parts of the wheel. The same is true for the Fire Company. The only way the firefighters can make their fundraisers and other projects go round, is to have their wheel complete and in place. The volunteers use the diagram of a wheel to visualize their committees and the delegation of tasks when there is lots of work to be done. They use it to plan their fundraising dinners, the auction, and their educational events. The hub is where the upper management or several core leaders are located. That is the center of the wheel and thus, the center of the organizational pattern. The center radiates out to the rim using spokes to support the rim. The spokes (leaders) are important strengths within the wheel that support individual tasks of the committee. Connected to each spoke is the rim. The rim is made up of individuals who have very specifically focused jobs to do. This is what makes the wheel-type organizational pattern work: the spokes that are supported by the hub, support the people who make up the rim. In the end, they collectively make the wheel go round and the committees are successful in their work. The Fire Company formed a Finance Committee in April 2005 to make financial plans for an addition to the fire hall and the purchase of a squad truck. It soon became clear that the two projects together would total one million dollars. Even though at one point the Committee members had been a month away from giving the go-ahead, by the fall of 2006 they arrived at the decision to completely halt the projects. It was too financially risky to proceed. In January 2007 the Committee met several times with several Bird-in-Hand community leaders. What a difference their support and encouragement made to the firefighters whose morale was low! It was time to make wise decisions and get the momentum rolling again. When the new squad truck was housed and it was time to move into the new addition in January 2008, only $110,000 of the one million dollars remained to be paid. 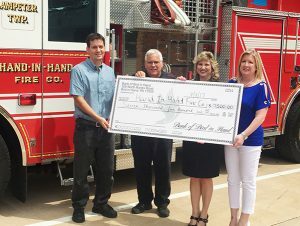 The Fire Company continued to steadily raise funds, dinner by dinner. At the Turkey Supper in 2009, the Finance Committee signed the checks needed to pay off the last two loans. Debt free! The million dollars had been completely paid with cash donations and pledges, Fire Company savings, the Ladies Auxiliary’s contribution, time and materials donated to the building project, and “The House That Hands Built.” What a wonderful feeling! By careful financial management, future firefighters were spared the burden of a troublesome debt. From 1991-1994 the Fire Company was in the toy business. It sold four models of Bird-in-Hand Fire Company Winross Trucks when that type of fundraiser was at the height of its popularity. A 1992 Special Edition model featured a box truck with a picture of the old fire wagon drawn by two horses. The 1992 Firefighter’s Edition had four horses pulling the wagon. Only 50 of these were produced and they sold for $100 each. Two different tanker trucks, one red and one white, were also available. The Fire Company grossed $10,000 from these sales and used the money to finish renovations and buy furnishings for the 1990 building project. Firefighters also remember catching chickens, carrying them upside down by their legs out of chicken houses, and putting them into cages to be hauled off on trucks. They were paid a few cents for each chicken that was caught. An amazing historical detail is that the Ladies Auxiliary also helped with this project, although they called it “housing” chickens. Understandably, this fundraiser never grew in popularity. Fundraising is the lifeline of the Hand-in-Hand Fire Company. Already in 1924 a committee of five ladies was appointed to plan a supper to benefit the Fire Company. 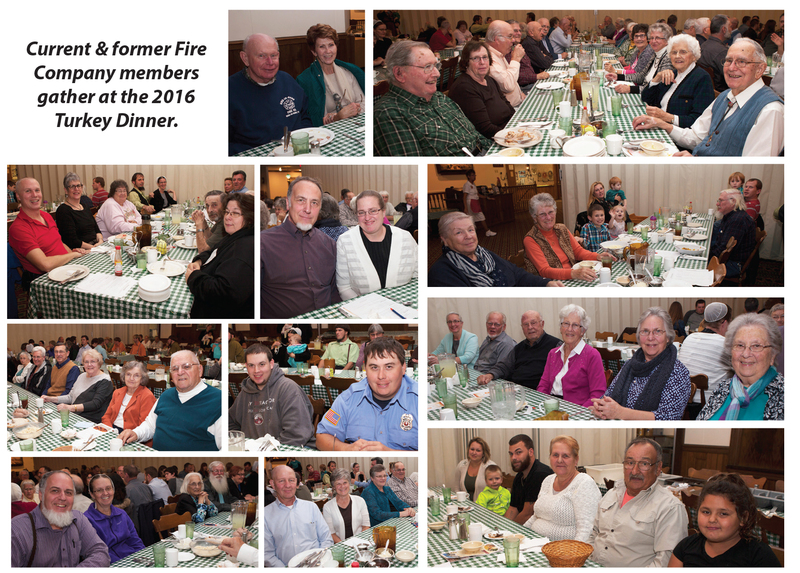 Since then firefighters and the members of the Ladies Auxiliary have served countless dinners knowing that 66% of their annual budget comes from their fundraising efforts that also include the Carriage Auction, rentals, and fire dues that residents pay. This Company’s members have been successful in their efforts as evidenced by the equipment they have bought and the building projects they have undertaken. A favorite way to raise money is through the benefit dinners that both the firefighters and Ladies Auxiliary members organize. Presently the Ladies Auxiliary members serve their ham dinners twice a year in April and October. Since the 1960’s Hand-in-Hand Fire Company has been famous for their delicious chicken barbecues made with their secret sauce on the Saturdays before Memorial Day and Labor Day. The firefighters have hosted a chicken potpie meal in February since 1994 where they make 500 gallons of potpie and serve 1500 people. Local people throughout Lancaster County are loyal attendees at the dinners. Also there is an extensive mailing list of 2200 people from neighboring areas and states who plan trips to Bird-in-Hand to eat the delicious Fire Company meals. In 2006 the Fire Company launched one of its most ambitious and rewarding fundraising projects ever in the “House that Hands Built.” In response to a major capital fundraising campaign, a local businessman donated a building lot in the housing development next to the fire hall. A plan was formulated to build a house on the lot using volunteer labor and donated materials wherever possible. 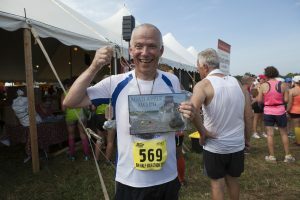 Amazingly over 100 businesses and individuals stepped forward and donated their time, funds, and expertise in a remarkable display of teamwork and charity. It was a very successful fundraiser with $275,000 from the sale of the house going directly toward the building project. The Fire Company is always open to considering new ideas for raising funds so it remains financially viable. Two new opportunities have come its way in recent years. One is the existing Lancaster County Carriage & Antique Auction that was moved to Bird-in-Hand in June 2008. That was the first year the firefighters and their families volunteered and assisted the auction committee during the week of the sale. The Fire Company also organizes and mans the busy food tents at the auction. For the past three summers this auction has grown tremendously in its new location and has proved to be a significant fundraiser. Both the auction and the food stands benefit the Fire Company. 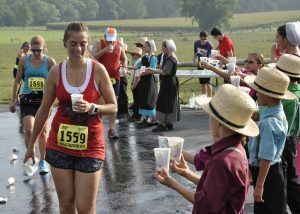 Coming up on November 6, 2010 is the first annual Amish Country Bird-in-Hand Half Marathon sponsored by the Bird-in-Hand Family of Companies and the Reinke Sports Group. 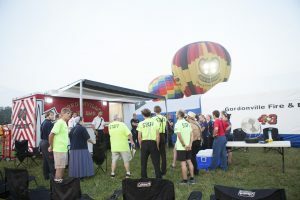 The Fire Company has been invited to run the food stands the day of the race and to serve the traditional pasta dinner on Friday night before the race. 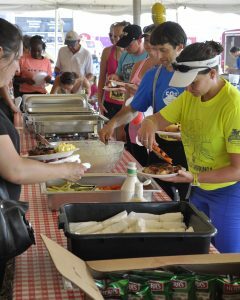 This will the members’ first attempt at Italian cuisine as they serve a buffet-style spaghetti dinner from 5-7 pm to race participants and their families as well as members of the community. There is a special welcome to all Bird-in-Hand residents to come out and enjoy the evening. The cost is $10 for adults & $4 for children. All of the food has been donated for the meal and the Fire Company is the beneficiary. As early as 1924 the Fire Company realized the worth of hosting fundraising meals because of the money they bring in and also as a way to get the community involved. The firefighters know that working together for a common cause creates a wonderful sense of community spirit and pride. On September 2, 1924 a committee of five ladies was appointed to plan a supper to benefit the Fire Company. Serving on that first committee were Mrs. Irene Morrin, Mrs. E.E. Brubaker, Mrs. J.H. Weaver, Mrs. Park Houghton, and Mrs. Harry Overley. The 50th Anniversary Celebration booklet states: This appointment was the beginning of the Ladies’ Auxiliary, which through the years has loyally made its contribution to the common good. Twenty years after that first benefit meal, the Hand-in-Hand Fire Company Ladies Auxiliary formally organized on September 19, 1944. The first officers were Edna Overley, president; Mildred Leed, vice-president; Celia Nagle, secretary; and Margaret Weaver, treasurer. The initial group had 23 members and their meetings were held the third Tuesday of each month. Some of their earliest activities were selling blocks at 15 cents each to build an addition to the fire hall, entertaining the Lancaster County Firemen’s Association in 1945, and hosting bake sales and spring and fall dinners. But equally important in the early years of the Auxiliary were the activities that the Social Committee planned for everyone to enjoy at the meetings. Bingo, guessing games, hat socials, hymn sings, recitals, recitations, and poem readings were popular. 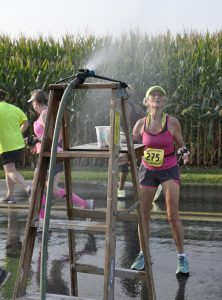 In a later decade, the ladies also took part in the tug-of-war at the County Firemen Convention and the bucket brigade contests at the New Holland Fair. Over the years the ladies went on bus trips and got together in their homes and in restaurants for Christmas parties. The ladies in the Auxiliary have been creative through the years in their fundraising efforts. The tradition of serving meals to the community to insure an annual income was begun in 1948, although they were not scheduled on a regular basis like they are today. In 1979 they bought a custom-built food trailer for $2,797 that they took to area sales. They have also served banquets, wedding receptions, holiday family dinners, and corporate employee picnics. Other fundraising events have been chicken corn soup, chicken patty dinners, bean soup, doughnut and baked goods sales, toy shows, Tupperware and Pampered Chef parties, housing chickens, and sales of T-shirts, shampoo, and Easter flowers. The Auxiliary is also service minded. In 1946 they knit sweaters for the Salvation Army and organized spelling bees at East Lampeter High School. They also supported the County Cancer Drive and local needy families. In addition to their impressive fundraising for the Fire Company (their total tally at the time of their 50th anniversary banquet was $90,470! ), they assist by housecleaning the fire hall to keep the facility in tiptop shape. Presently the Auxiliary’s main fundraisers are their ham dinners in April and October that started in 1965. Tourists and locals alike enjoy delicious ham, green beans, buttered potatoes, applesauce, pepper cabbage, pies and cupcakes. They also organize a community yard sale in the fire hall at the end of April. Working together for a common cause unifies the members of the Auxiliary. They become friends as they serve food and drink to the firefighters at major fires, enjoy a June picnic with all the Fire Company families, help with food at Family Days, decorate the fire hall for Christmas, and give thanks at the annual Fire Company Turkey Supper. The phrase, “A little help from our friends,” describes the relationship between the Ladies Auxiliary and the Fire Company except that the Auxiliary is a big help, not just a little help. The ladies have done a terrific job over the years of supporting the work of the firefighters. Now in 2010 they as an organization are in the process of redefining themselves. They are considering opening their membership to community men as well as women. There are men who are very interested in working with various Fire Company projects, but these men are not firefighters. An idea is to bring all of the fundraisers under the umbrella of an expanded Auxiliary in which both men and women would be involved. The Ladies Auxiliary has played a significant part in raising money to fund both large and small projects of the Fire Company.